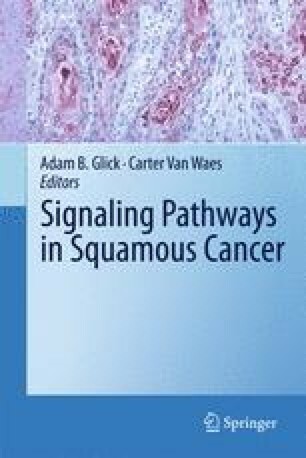 Genetic mouse models have clearly demonstrated that either activation or attenuation of the transforming growth factor-(TGF-)β and the TGF-β signaling pathway can have a major impact on either the genesis and/or the progression of squamous cell carcinomas (SCC) in the epidermis as well as in the head-and-neck region. In general, inactivation of the TGF-β signaling pathway in stratified squamous epithelium promotes the de novo emergence of benign papillomas that have the potential to progress to invasive SCC. On the other hand, activation of TGF-β signaling in established SCC clearly favors their progression to highly invasive and metastatic SCC. Furthermore, a large number of reports of structural and functional alterations in TGF-β pathway components in human SCC cell lines as well as tumor specimens strongly support the idea that this pathway in general, and TGF-β receptors in particular, play an important role in human SCC as well. Attenuation of either Type I TGF-β receptor (TβR)-I or -II signaling promotes SCC development in mice, and mutation and/or loss of expression of TβR-I or -II receptors are commonly seen in human SCC. Thus, approximately 10–15% of head and neck squamous cell carcinoma (HNSCC) display evidence of functional inactivation of TβR receptor signaling, as defined by the absence of pSmad2 and -3 or the presence of an inactivating TGFBR gene mutation. Patients with this tumor type appear to have a particularly favorable clinical outcome. On the other hand, in approximately 40–60% of human SCC TβR expression is reduced but not eliminated. In this context, exposure of the tumor cells to bioactive TGF-β will activate a proinvasive and -metastatic gene expression program, thereby conferring a worse clinical outcome. Therefore, we would like to propose that a structural and functional analysis of the TβR receptors potentially represents a powerful prognostic tool for the management of patients with SCC.